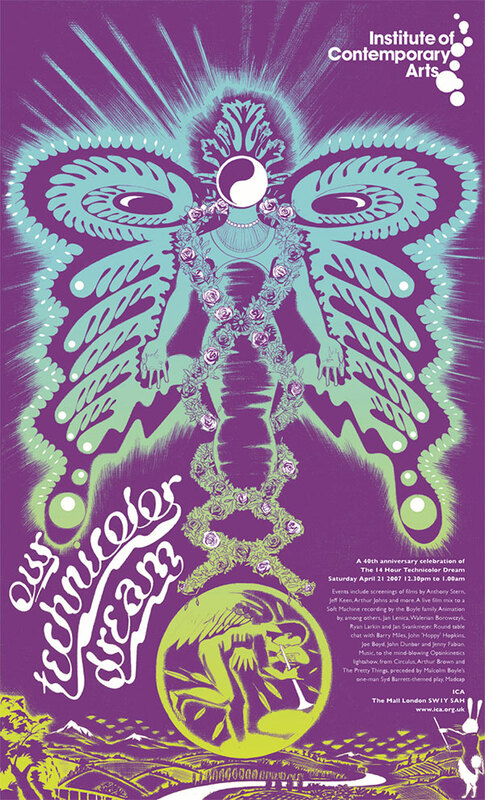 Two colour silkscreen poster promoting a one day psychedelic event at the Institute of Contemporary Art, London. April 2007. 734mm x 425mm. Technology had changed in the fourty years since I last produced a psychedelic poster. Psychedelic posters in 67 used cameras to copy the two artworks needed onto film for the two screens used in the silkscreen poster. The first screen printed the rainbow ink effect, produced by laying out two separate inks which would then be blended by a single pull of the squeegee. The second screen carried the picture for the black inking. As the printing progressed the inks where changed, no two posters where the same. The 07 poster used only one artwork for filmwork. The principal image was scanned and printed purple on the poster. The second artwork was created as a new digital layer by Dinah Lone, who also produced the typography, and digitally developed from the first to create filmwork for the blend printing.